Get to the point already. That’s what your users might be thinking when they’re reading your blog posts or emails. And if they’re waiting impatiently for you to get to the point, they are far less likely to be primed and ready to respond when you finally unleash your call-to-action. Because being concise in emails and blogs posts is essential. Keeping your emails and blog posts concise is about more than cutting out long introductions and useless banter. Concise writing is about ensuring that your communication with your users is specific, thoughtful, and useful. It’s not just about cutting words, it’s about finding the right words. Being Concise in Emails: Why is Shorter Better? There are two primary reasons that shorter emails and blog posts tend to be better for marketing and customer communication purposes. Time is precious. Your customers are busy people! If they’re perusing your content, it’s likely for a reason, and they don’t want to spend a lot of time reading through your life story in order to find the information that’s more valuable to them. It’s not that your life story isn’t interesting — it’s just that blog posts and emails should focus on communicating useful information as efficiently and persuasively as possible — it’s about being concise in emails and blog posts. That’s what customers expect and they’ll be a little miffed if you waste their time. You babble. Writing is a process, so sometimes it’s a struggle to find the right words to adequately express your ideas (especially if your ideas happen to be complex). When you can’t find the right word, you sometimes use several. When you can’t articulate the right idea, you might sometimes meander. So you can see how easy it is for even seasoned writers to get off track and become unfocused. It’s not necessarily that long blog posts are bad or that long emails just don’t work. The trick is to make any email or blog post only as long as it needs to be. So let’s look at three tips to help you write emails and blog posts that are concise. The very first step you should take when being concise in emails or blog post is to focus on organization, whatever from that may take. When you’re writing a journal or a diary, you can be as unfocused as you’d like. But if you’re creating a blog or an email, you really need to spend some time beforehand thinking about how you’re going to organize your piece. Who’s your audience? Who are you really writing for? Most professional writers will imagine that they’re writing to one or two individual people (marketers will often refer to these as personas). You can tailor your message for your audience to ensure that your blog post or email is relevant. How are you going to persuade? Connecting your audience with your intended message isn’t always easy. If you spend some time considering the approach you’ll take, you may find your message a little more thoughtful (and as a result, a little easier to concisely articulate). Once you’ve answered those questions, you might want to spend some time outlining your email or blog post. 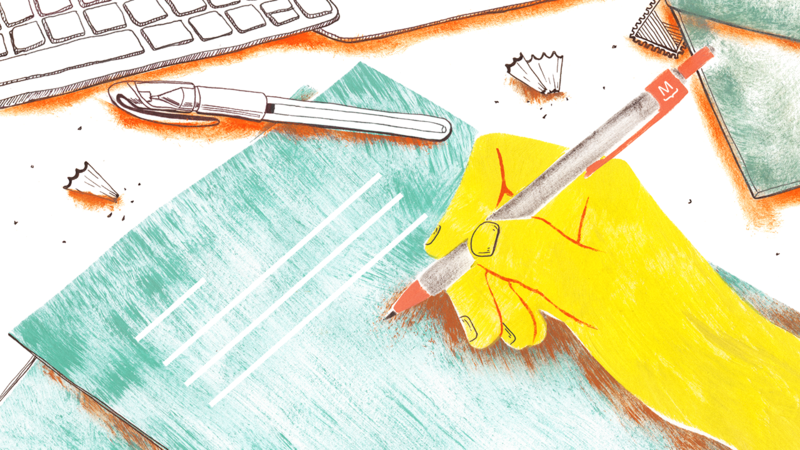 We know, we know — not everyone is thrilled with the idea of outlining when being concise in emails. But even a simple outline (the planned headings or the big topics you plan to discuss) can go a long way towards keeping you on track. Likewise, writing is a process-based craft. You’re not going to knock it out of the park on the first try all the time. Reserve at least a little bit of time to revise. During the revision process, you can eliminate many of the unhelpful words, phrases, and sentences from your piece, improving your overall concision. Interested in learning how journalists structure content? Find out in Writing Like a Journalist: The Inverted Pyramid. Once you’ve completed the planning stage, you can finally begin composing your email or blog post. The composition process can be anywhere from smooth to tense, depending on the day. But there are a few tricks to keep in mind as you’re writing that can help you stay focused on being concise in emails and creating a thoughtful, concise piece. There are some words that just aren’t particularly potent. Instead, they just fill space, slowing down the reader along the way. The best example of a word like this is “very.” Don’t be fooled, this word finds its way into everyone’s writing from time to time. But it’s a word that reminds both writers and readers of one thing: you could have done better. So as you’re writing, occasionally search for “very” and, when you find it, replace it with a better word or phrase. “Very” isn’t the only word you should avoid when being concise in emails. There’s a group of words collectively (and loosely) known as weasel words. These are words that tend to obscure your meaning rather than refine it. Often, “weasel words” are an artifact of incomplete research, and any reader that catches them will question your credibility. “Research says…” – Be specific about the research. Are you talking about a specific study that was conducted? Mention the study. “Experts say…” – Who are these experts? And why should I believe them? Naming the experts can fend off some of those questions and increase your credibility. “Often…” – How often? Be specific. If you aren’t sure how often something happens, then you should probably mention that as well. Any overbearing use of jargon will become a collection of “weasel words.” The only thing a reader understands when jargon gets in the way is that the writer is not a great communicator. The easiest solution is to ensure that you take the time to be as specific as possible in your writing. However, achieving that level of specificity on a consistent basis can be challenging, so don’t be too proud to use one of the many writing assistance apps available today. Your email and blog posts should be no longer than they need to be. But sometimes it’s nice to know what kind of attention span you can expect your readers to exhibit. Make no mistake, readers will have very different expectations of emails and blog posts when it comes to length. You’re going to want to keep emails relatively short. If you’re writing an email newsletter, for example, feature only snippets and previews of all of your top stories when being concise in emails. Your readers are not going to want to read a long email. Just about any email you send should be 500 words are less — and even that is pushing it. Break your emails up into discreet and easy to read paragraphs. The word count “sweet spot” for your blog post will vary on the topic. However, most blog posts will be around 1900 words. If you absolutely cannot write about your topic in fewer than 2000 words, consider breaking your blog post up into several installations (part 1, part 2, etc). Shorter blog posts are not necessarily bad, but you do want to make sure you’re giving your readers enough material to make your blog post worth the click: not too long and not too short. The final part of the writing process is often the hardest — and it’s the part that most of us tend to skip right past when being concise in emails. Once you’ve written a concise draft of your email or blog post, you need to polish and revise it. You can look for content to cut along as you go. When you speak, you might repeat a certain point for emphasis. You might say something like, “in other words….” But writing generally works better without those repeated phrases, unless you have some kind of persuasive purpose in mind. So keep an eye out for redundant words and phrases or any time you might repeat yourself. When you cut such redundancies, you make your writing clearer and more concise. This is counterintuitive, to say the least. That’s because we tend to think that the more we explain something, the more clear it becomes. We have to resist the urge to over-explain – an act that will both bore and alienate the reader. Cutting out redundant language can help us keep this tendency in check. Your beta reader should be someone with a keen eye (to catch typos and misspelled words). Your beta reader should be someone you trust (and, if necessary, someone who is authorized to read what you have written–be conscious of any non-disclosure agreements you may have signed). Your beta reader does not have to be an expert–it could just be someone sitting in the cubicle next to yours. A beta reader is generally tasked with making sure that your email or blog post is understandable and that the core concepts are communicated effectively. Which Email Are You Sending? Our discussion on blog posts and emails has been pretty extensive, but it’s worth spending a little bit of time talking about what kind of email you’re sending. My advice on brevity applies to both personal emails and email newsletters, but just how concise those emails should be might vary. Excising those pleasantries in the name of being concise will likely only alienate customers (you’ll have to find a balance in there somewhere). That said, many companies have instituted a “three-sentence” rule for inter-office communication in order to promote brevity and rapid responses. Under this rule, every email should be under three sentences (with some exceptions, I’d imagine). Wondering what you should be saying to customers? Find out in 11 Things You Should Never Say to Customers in Emails. Brevity is not a virtue unto itself. There’s no trophy for world’s shortest email or blog post. Which means that, for as much emphasis as we put on your ability to be concise, that should not be the end goal in and of itself. Rather, concise writing is a way to make your emails and blog posts more effective. When you’re forced to reign in your wordier tendencies, your writing becomes more focused, more intentional, and more thoughtful. And that improves the quality of your prose, whether it’s your latest and greatest blog post or a simple email to a vendor. By eliminating what’s unnecessary, you put more focus on what’s relevant and meaningful to your readers – and that will only help your business in the long run. “Simplicity is the ultimate sophistication.” So said Leonardo da Vinci over 500 years ago in Renaissance Italy. Clearly, he wasn’t talking about email marketing (although he did predict many other future technologies!) Nonetheless, we can still apply his wisdom to the contemporary “art” of writing awesome email content. Yes, I want to receive MailPoet's insightful monthly newsletter. Notify me of followup comments via e-mail. Or subscribe without commenting. Our monthly newsletter includes tips and sometimes news about us. Great! Check your inbox to confirm your subscription.